It's the time of year again for my favorite annual sites and apps. 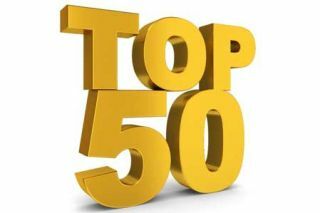 This year's list will be a little different as I list my favorite 50 instead of 100. The reason for this is not as many new learning tools came out this year compared to years past, while more current tools focused on regular updates. However, that does not mean there are not a lot of new items to look through, as sites/apps for programming/coding, math/STEM, and game-based learning played a predominant role in this year's list. As with any of my previous annual top lists, all tools listed in previous posts will not be eligible for this year's list. * Seesaw - Excellent free mobile app (Android/iOS) for students creating digital portfolio with educational portal. * Oncore - A free to use iPad app for teachers that acts like an all-in-one Learning Management System, where educators can assess students, take attendance, communicate with parents, and much more. * Plotagon - A wonderful site/app for digital storytelling where students create animated movies (i.e Xtranormal) by typing a script. Grammarly - A terrific site for helping students with their grammar, spelling, and more with detailed reporting. * Sketch Nation - A great free site/app (iOS/Android) for creating games. Students can also work on their STEM skills and learn the basics of programming. * Ignite Teaching - An excellent free iPad app for Project Based Learning through collaborative digital presentations/projects. Help Teaching - A very nice site for educational resources, printables, assessments, and more. * Class Compete - A super fun and innovative Game Based Learning system for grades K-8 in the subjects of Math and English. * WhatsDue - A cool new free mobile app (iOS/Android) for keeping students and parents up to date on what is happening in the classroom. Modern Chalkboard - A great site for finding free Smart Board resources and tutorials. * Galxyz - An innovative mobile app (Android/iOS) for Elementary Science that is COPPA compliant and aligned to Common Core Standards. * Mystery Word Town - The excellent mobile (Android/iOS) app that uses Game Based Learning to help learn and spell words. * Box Island: One Hour Coding - A fun free iOS app for ages 6 on up learning the basics of coding. TenMarks - A very popular site for Math for grades 1st-12th that tracks student progress as well as helps teachers differentiate instruction. * Bloomz - Bloomz is a free (iOS/Android) app for educators looking to communicate with parents via mobile devices. * Monster Math - An excellent iOS Math game with high replay value that helps students learn their basic Math Skills through an innovative platform-type game. Versal - A nice site for creating interactive digital lessons, that is ideal for online learning. Learnteria - A new site for educators looking for reviews on a wide variety items, such as: sites, books, apps, and more. * WonderBox - A wonderful free iPad app for students learning a number of different subjects (i.e Math, Geography, Science, etc) through use of videos, maps, images, and more. Story Shares - An interesting new site for readers grades K-12th. Story Shares creates digital books that are customized per Reading Level. * Quiz Hero - One of my favorite (iOS/Android) free apps that uses RPG game elements to learn a variety of subjects, such as: Math, Vocabulary, Science, etc). * Tickle - A fantastic iOS app to learn how to program by dragging blocks of code together, that works on items such as: Sphero, drones, etc. Quizizz - A excellent site for creating multiplayer quizzes where educators get results in real-time. * CodeQuest - A fun iOS app that helps teaches students learn how to code in CSS or html, ideal for STEM. Choosito - A new and safe way to search the web for students and library resources. AlfaTyping - A great site for educators for students to learn how to type while educators track their progress. * Milk Hunt - A entertaining Math game for 1st-5th grade that has students collecting bottles of milk while answering different questions. * Make It - A nice iOS app for grades K-2nd for creating games, stories, slideshows, and more. * Flashsticks - An innovative site/app for learning a foreign language through interactive post-it notes. * Brownie Points - An excellent free iPad app for Math grades K-7th, that uses an incentive based learning system. * myBlee Math - A nice free iOS app 5-12 yrs old learning Math. myBlee not only tracks student progress but offers rewards and puzzles in a wide range of Mathmatical topics. Erase all Kittens - A unique site that has students "hack" through the levels of a game to rescue all the kittens. A nice way to learn how to code and ideal for STEM. Lumio - Excellent site/company for Math games and resources, ideal for mobile learning or a 1:1 environment. * JellyBean Scoop - An interesting new site/app (Android/iOS) for finding "true" stories divided into four Reading levels. Be sure to check out JellyBean Writer too!! LearnBop - A great site for educators teaching Math in grades K-12 that tracks student progress and allows educators to differentiate instruction. FlipQuiz - A fun site for creating Jeopardy style game quizzes. * Spell 'till you Drop - A super fun iPad app that has students learning how to spell while playing through a game of building a bridge, with over 600 words included. * Code Blast - A nice introductory to problem solving by programming a rocket in this fun iPad app. * Explain 3D - Is a innovative mobile (Android/iOS) app that acts as an interactive encyclopedia that has a wide range of simulations on topics such as electronics, machines, and more. * Scoodle Jam - A great iPad app for grades K-6th ideal for Project Based Learning. Students can create presentations, drawings, projects, and more as well as choose through lots of educational templates. Study Ladder - A wonderful site for educational resources and games on a number of different subjects. * Monster Physics - An excellent iOS app for kids ages 9-11 learning the basic concept of Physics by creating their own interactive creations. * Zap Zap Math - A cool free mobile (iOS/Android) app for self paced learning in Math. * NumberShire - A terrific site/app for K-2nd learning basic Math concepts that tracks student's progress and is aligned to Common Core Standards. * Counting Kingdom - One of my favorite iOS apps for addition/Math for kids 6-8 yrs old that uses the popular "tower/defense" style game. * SlateMath - A free iPad for young learners learning the basic concepts of Math and numbers, with over 38 different activities. Kidtopia - A nice safe COPPA/CIPA compliant search engine for kids/students. Telling Time with the Smurfs - A great and fun way for students to learn how to tell time through an interactive story with Papa and Brainy Smurf.